Herb gardening is ideal for people who love fresh herbs but have a limited space for a garden since they will grow virtually anywhere. You don’t need to be a green thumb to grow herbs since they are amongst the easiest plants to grow. First get an idea on what herbs you’d like to grow, then do a little research (usually seed packages contain viable information) to determine whether they are adaptable to your climate and how much room they need to grow. Some herbs, like mint, are invasive spreaders and can take over a garden if not carefully placed and maintained. Most herbs will require a significant amount of sunlight, between 6-8 hours a day, and should be grown in an area that will provide it – normally on the south or west side in the northern hemisphere. Water regularly but be careful not to over water, which in some cases can cause root rot, meaning death to the plant. Most herbs can be grown in containers, which is ideal for many people who have very limited space, have pets, or live in an area of intense climate changes. Some herbs like rosemary and thyme can be grown in containers, but are hardy enough to endure most climates and pest if planted in the ground. One of the best aspects of small container gardening is that they are mobile and can be moved in the event of inclement weather, even indoors during the winter months. You might also want to learn about drying and/or freezing some of your herbs for the winter. Another method of herb gardening is hydroponics which in essence is a method of growing plants without soil and has grown more and more popular each year. 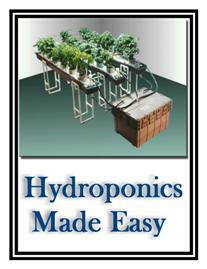 You can build your own hydroponic unit or there are many on the market today designed for indoor counter tops. As you grow your own herbs you’ll discover that not only do they add wonderful flavors to food but some even possess medicinal properties that have been used for centuries to combat indigestion, fatigue, and a wide variety of other ailments. Some, like basil, are known to repel insects like mosquitoes, which makes planting basil near or on a patio a great idea. Planning a herb garden is pretty easy and a lot of fun. You may already have an idea on what you’d like to plant, but if not here’s six I’d recommend for starters that will go with just about any kitchen, basil, oregano, dill, cilantro, rosemary and thyme. It’s always fun to add another one or two herbs every year to your garden and soon you’ll be the envy of all your neighbors. Many herbs like basil are annual, meaning they will die and need to be replanted every year – although some will grow back themselves from their own seeds. Others are perennial like rosemary, meaning they live at least two years. It’s always a good idea to have a mix of both. Whether you decide to grow your herbs indoors, outdoors, in the ground, or in containers, you’ll find herb gardening satisfying and rewarding.